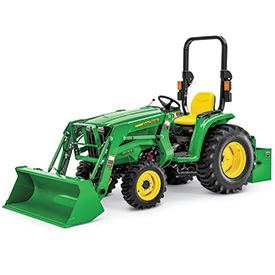 The John Deere 3E Series compact utility tractors offer customers ultra-reliable machines that are powerful and easy to use. Providing a tight turning radius, the 3E machines are extremely maneuverable and increase wheelbase and weight for improved machine stability. Easy to use, color coded controls increase overall comfort and convenience during operation. The independent Power Take Off (PTO) system eliminates the need to stop and clutch to engage or disengage the PTO. An easy-to-use, two-range hydrostatic transmission increases tractor performance while eliminating clutching for fast and easy direction changes. Additionally, Twin Touch™ foot controls provide an automobile-like experience while reducing operator fatigue.